﻿﻿What looks to be a huge aqua upside-down couch done in bathroom tile concaves gently to frame the large darkwood bar on the side of the restaurant. 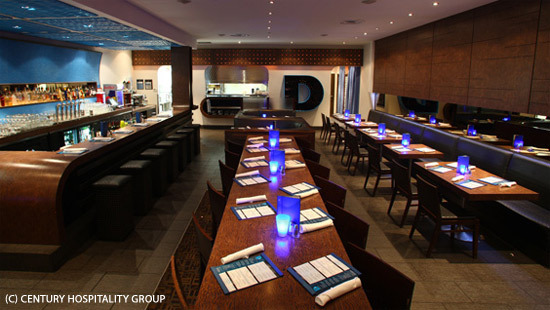 Dark browns, stainless steel and some aqua accents along with comfy booths give Delux an air of sophistication while maintaining a comfortable atmosphere. Service was polite, courteous and enthusiastic without being overly effusive nor intrusive. The exceptional service was a pleasant surprise and exceeded my preset expectations of a burger-bar joint. The service staff while dressed in forgiving black and the occasional jeans - It was also honestly refreshing that the female staff were not required to have the plunging necklines ubiquitous at many bars and restaurants. Thus a more level playing field for staff - tips are based on actual service and the food rather than how much of a peek of cleavage you get served with your meal or how lecherous the customer. A pleasantly wide variety of wines and beers are available, along with some premium sodas and milkshakes of the unalcoholic sort. Happy milkshakes are also available with 2oz of liquor - you can choose your own combination, or go with Delux's creations. Tempted to try a wine or beer but don't want to look silly or stuck with something that doesn't jive with your meal? The drinks menu also has a helpful brief taste profile beside most of the wines and beers for the uninitiated. Peeking at the menu, Delux offers a decent selection of enormously proportioned salads, a few variations on the humble burger, a decadent sounding Kobe burger with all the fixings, Nathan's hotdogs, sharable miniature Kobe sliders, mini hotdogs and a lobster studded plate of nachos for a twist of decadence on a big sports game favorite. And the requisite deep fried things - fries, poutine, and Stella Artois beer battered onion rings. They had me sold at putting Stella beer into the batter! 1) Nathan's mini hotdogs served with caramelized onions and a chiptole ketchup came out first - Nathan's is a cherished hotdog in the US where they pride themselves on make a juicy dog with a characteristic snap when you bite into it. The minidogs, though flavorful and juicy, sadly lacked that pop when the casing was broken. The few bits of gently caramelized onions that peeks out the bottom of the dog added a marvelous sweetness, although the chipotled ketchup took more away from the dog - using smoked chipotle peppers would add depth and character rather than just plain heat. 2) Stella Artios beer battered onion rings - the batter was light, fluffy, thin and delectably crispy. The beer didn't add much flavor to the seasoned batter, but gave the batter a airiness that offset the grease it oozed after you bit into it. Probably one of the best onion rings we've had in the city. A side order is essentially as large as a regular order - though a regular order is served in a fun mini shopping cart. Yup - a mini grocery cart. Not as macho as the guys would like, but definitely is a hit with the ladies. Our waiter had mentioned the special which was a celebrity chef combination - a slight change of bun and seasoning spice on the signature burger. After much mulling, we ordered Delux's signature burger, and the Kobe beef sliders to get a better representation of the menu and to save tummy room as all the portion sizes at Delux are very large and generous. 1) The Delux burger - A blue cheese infused (translation - bits of it is blended into the patty) 1 inch thick 8oz of grilled black Angus beef patty is topped with several large thick slices of deep fried crispy double smoked bacon, gently caramelized onions (I like my onions caramelized to a rich milk chocolate color, Delux's had a trace of golden brown), tender and juicy grilled portabello mushroom slices that just elevates this burger beyond ordinary. All held together with a soft ciabiatta bun and a large skewer - this sucker was 3-4 inches high! The patty itself was moist almost to the point of mushy largely due to the blue cheese mixed into it. The cheese lent a strong gamey flavor which became a bit offputting as the burger cooled off. The burger was cut in half to facilitate customers valiant attempts to take a mouthful with all the toppings... one side would easily dwarf a regular sized burger from any other joint in town, so burger lovers with large appetites rejoice! 2) The Kobe beef sliders - A miniature and trimmed down version of the large Kobe beef burger. The main difference other than size - the three sliders come with in house made mayo, tomatos and lettuce with bacon and applewood smoked cheese optional for $1 more on small kaiser buns. The entree sized burger - the Kobe Stack has all of the above with bacon and cheese not optional on a large kaiser bun and a $7 increase in price. The sliders had a nice smokiness from the grill, and though unseasoned, had a subtle sweetness that made me look to see if there was finely diced onions in the burger. Kobe beef, being a richly marbled meat imported from cattle in Japan that get daily massages and drink beer makes for a super tender burger. Delux may want to run the meat through the grinder twice as I found a few small pieces of gristle in the burger. And if you're going to have the sliders, make sure you add on the cheese and bacon. Nom. I wonder if I can get the portabello mushrooms on the sliders next time.. mmmmmm. Being waaaaay too full after nearly finishing off all the mammoth sized plates of food, we passed on trying Delux's desserts - milkshakes made with Pinnochio icecream, and the scoops of the icecream with cookies or as a banana split, as well as minidonuts. We did however made a decent dent into the complimentary cotton candy - a fun nostalgic and sweet end to a meal that thankfully did not tax our tummy space and belts anymore. Quibbles - lost points in taste profiles for the lackluster chipotle ketchup and not seasoning burgers but got bonus points for excellent service. A small kids menu is available, but with the loud music and the noise level, you're better off getting a babysitter and enjoy a parents night out - the crowd leans more towards a more refined but casual couples, girls/guys night outs. Overall, a good place to go when you have a craving for a satisfying and honest burger without the frills, excellent service and a drink with friends. Cannot say that I particularly enjoyed it there... too pretentious for a burger joint!